Freedom Aviation has been very busy with Night Flying in 2015. With the certification of Kemble’s excellent new lighting system, so far 7 people have completed, or are about to complete, night ratings and a further 6 are checked out to fly at night. But what makes night flying so special? And what’s involved in gaining a night rating? Everyone likes flying in the smooth clear days that winter can often bring. Well at night, gone are the thermals which cause many an unwanted bump and the evening sky is often replaced with the smooth still air which all aviators dream of. The view out of the window takes on a whole new magical appearance. Navigation is aided by large towns, roads and lights. Water all but disappears and circuit joins become a new challenge. Day trips to Le Touquet are no longer cut short by fading light, so you can enjoy that hour on the beach. So, are you caught up in the romance yet? Yes? Good. Here’s what is involved. There are no pre-entry requirements to fulfil for the Night Rating – you can even include it in your PPL course if you have the flying skills of Douglas Bader. However, some experience of instrument flying is a good idea. If you’ve recently passed your PPL Skill Test, you should be fine. If that was a while ago – no problem – you’ll soon get the hang of things. After a thorough briefing, the first two hours will consist of some general handing and local area navigation to get you used to flying at night. The ‘picture’ remains the same, but some key sensory inputs are missing when flying at night, so these need to be explained and compensated for. At Freedom, we like to take students on a Navigation exercise around the London TMA. 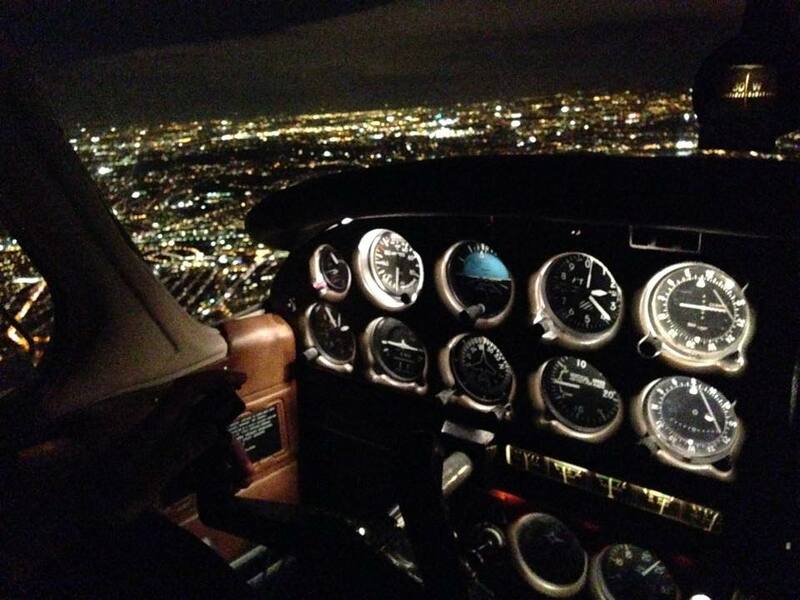 This enables students to not only get experience of busy airspace, radio work and flying at night, but to get some truly stunning views of central London. You’re able to pick out all the famous landmarks – The Shard, The London Eye, Canary Wharf etc. 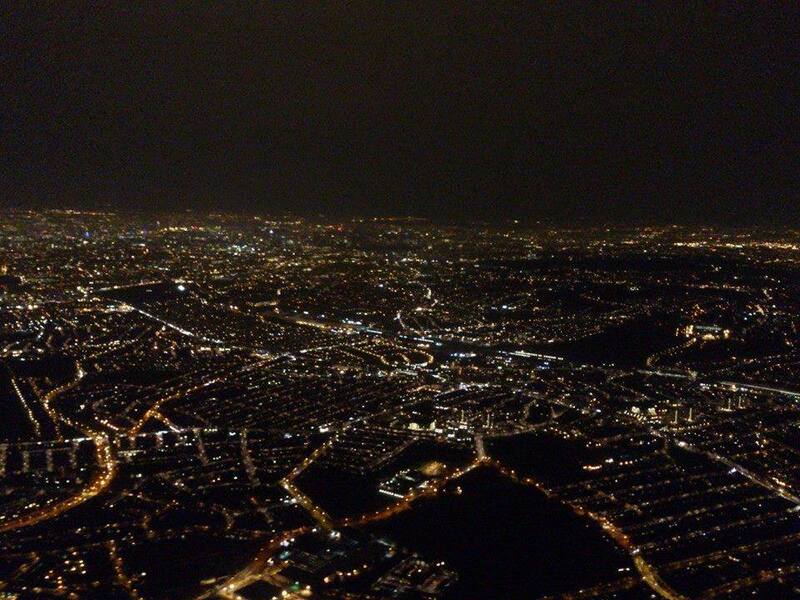 After getting to grips with night flying, it’s into the circuit. You’ll get experience at flying circuits in the dark and taking really good care to maintain the correct approach gradient – you don’t want to be low at night! Once that’s all mastered, your instructor will start turning things off! That’s when the fun begins. How well do you think you can land with no landing light? Or no internal lights? Once that’s all sorted (it’s not difficult – honest) you’re released for solo work. Kemble is currently open until 8pm every Thursday. Remember – official night is 30 minutes after sunset. As the nights get longer (currently by approximately 12 minutes a week) there are only 6 nights left before the clocks change! 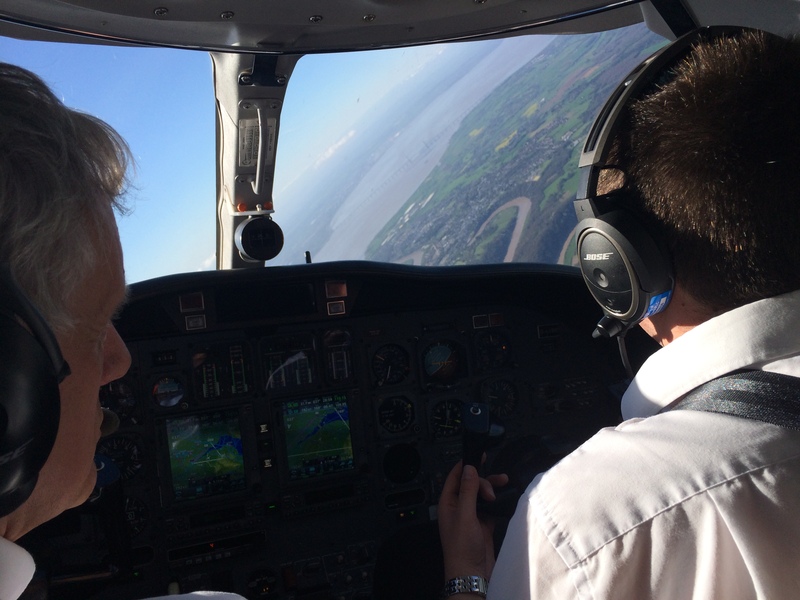 With 3 instructors and 5 aircraft available most Thursday evenings, is it time you had a go? Originally written by Tony Markl, the article below has been edited and adapted by Benjamin Ward for application in the UK. Tony Markl was a very experienced tail-wheel instructor, clocking up over 17,000hrs in over 40 types of tail wheel aircraft. The original article can be found here. 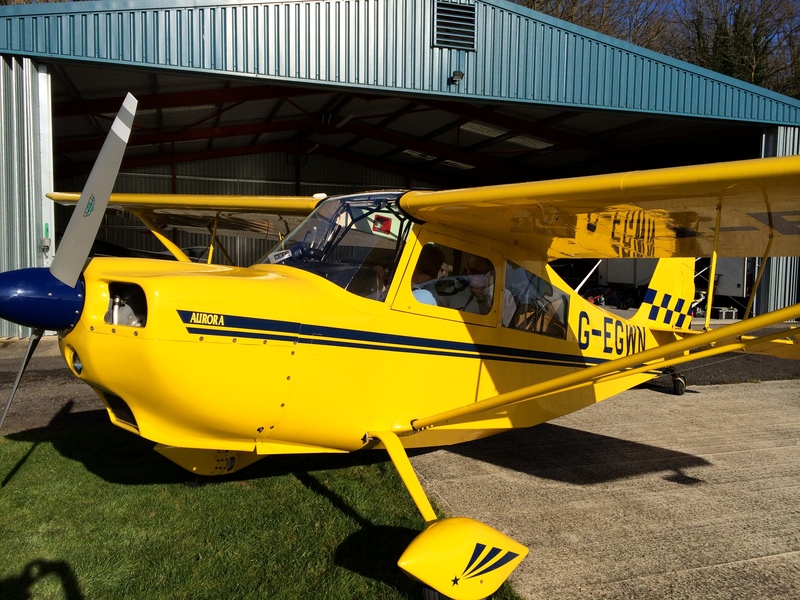 One of the many things which entice pilots to take up tailwheel flying is the presentation of new challenges. There are many ways to fly a tailwheel aircraft, and each aircraft requires a slightly different application of the techniques. To fly a tailwheel aircraft well, the pilot has to add a few new tricks into his tool box. Here, we take a look at Wheeler Landings. When should a Wheeler Landing be done? Wheeler landings are best implemented ‘in anger’ when there is a strong crosswind or when the wind is gusting from any direction. Additionally, wheeler landings may be completed any time the pilot feels like it or if they are uncertain about the landing surface. Remember – wheeler landings are a skill, so must be practiced regularly. What is a wheeler landing? Firstly, a wheeler landing is considered to be more difficult than a 3-point landing, which is why many pilots avoid attempting them. For this reason, regular practice is important on all surfaces in all conditions so that when a wheel landing is actually needed – the pilot feels comfortable and is able to successfully complete the landing. However, pick the practice runway carefully – narrow runways with dangers for running off the side are a bad idea. Grass runways with clearance either side is a good idea. Think of the skill level similar to a good PFL – regular practice should be undertaken so that if there is an engine failure, you are able to perform the PFL when the time matters. Pilots should make a conscious choice about which landing to perform when on the downwind leg. Good practice should be to verbalise this – if only to yourself. Changing your mind on final will only increase the workload, and is likely to lead to a sub-standard landing. 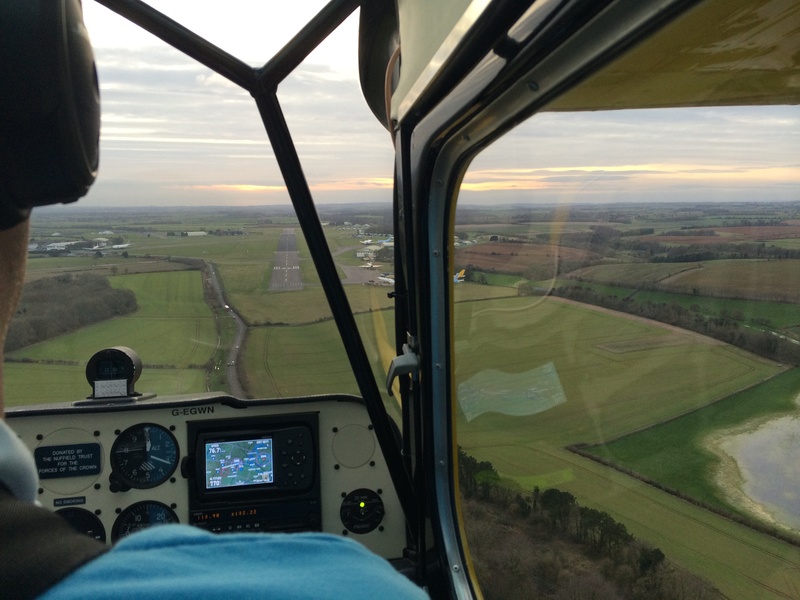 When performing a wheeler landing, do not concentrate on touching down on the numbers, as this will most likely result in excessive rate of descent, leading to a bounce. Using sideslip on final, touch down on the upwind wheel first. If control is maintained, touch down the downwind wheel and then complete the landing if control is still maintained. Use approximately 1800rpm for better control during the approach. This will also make the touchdown last longer, giving a slower deceleration and more time to “feel” for the runway. Approach speed should be at least 10% faster than the normal approach speed, especially in gusty conditions. A helpful technique may be to leave the elevator trim at approximately the cruise setting. This will give a nose down force on the stick, and remind you that you are intending to perform a wheeler landing, as well as keeping the aircraft descending during the transition to touchdown. Do not think of this transition as a ‘flare’, as this transition from gliding to touchdown requires that you not raise the nose as you normally do. Maintain the gliding attitude, and start your transition from gliding to touchdown at the lowest possible height. The aim is to reduce the rate of descent without losing airspeed. Look towards the end of the runway and “stair-step” your way down. Stair-stepping is the technique of continually moving the stick forward an inch then right back to where it was until the aircraft has touched down. Three to five stair-steps will make a nice touchdown, avoiding any bounce. Do not look at the airspeed indicator below 200ft or during any part of the transition. If the touchdown speed is not high enough, or the descent rate low enough, you will touch down in a 2½-point attitude with not enough speed, leading to bouncing between the main gear and the tail wheel. After about 5 or 6 bounces the aircraft will run out of energy and stall. If you are bouncing, and the wind is not such that it requires a wheeler landing, you may convert to a 3-point/full-stall landing at this time by bringing the stick all the way back. Do not convert to 3-point unless the aircraft is pointed down the runway and is at a height at which you are willing to stall, and there is NO drift. If these conditions are not met, your correct move is to “Go Around”. Do not try to salvage a “bounce”. If you are good enough to salvage a bounce then you are good enough not to have bounced in the first place. As soon as you know you have touched down on the windward wheel move the stick forward. This goes against the grain for nosewheel pilots. Everyone worries about a prop-strike. In a few aircraft with long noses or big props this can be a consideration, but for typical aircraft such as Champs and Cubs, do not worry. The aim is to maintain the best possible control of the airplane for the longest possible time. Having the tail up high gives better control at a time when we need the best possible steering. When speed drops and the nose starts to rise, meaning tail is starting to come down, move the stick fully backwards and get best steering by use of the tailwheel. Reduce power to idle when you are sure you can make a full stop landing, not before. After touchdown, whilst decelerating, is when most wheeler landing accidents occur. The higher touchdown speed of a wheeler landing gives you more rudder and elevator authority and directional control. After touchdown, increase aileron input until you have full aileron into the wind to prevent the upwind wing from rising. “Tiptoe” down the runway, only making small rudder inputs. When first learning wheeler landings it is acceptable to continuously wiggle the rudder. However, it is not acceptable to put in a correction and wait to see the effect. If you swerve in an amount that makes you uncomfortable, the correct procedure is to “go around”. If you wait too long, a “go-around” becomes a poor idea and you should consider accepting the indignity of going off the runway, as long as the terrain in front of you is OK. In strong wind the aircraft may stop quickly, and your biggest problem may be taxiing to a tie down. If this is the case, get a wing walker to hang on to the upwind wing. Maintain aileron input, and keep on “tiptoeing” down the runway. It is more important to stay parallel to the runway than it is to stay in the center. If you are parallel and on the side, be happy, do not try to go back to the center. When the aircraft has slowed down to a safe taxi speed, vacate the runway and congratulate yourself on a successful wheeler landing! As most of you know, sadly I left my full-time role at Team Freedom in April to take up a new role flying Cessna Citation Jets. Dave has asked me to jot down a few of my experiences during training for anyone who is interested. 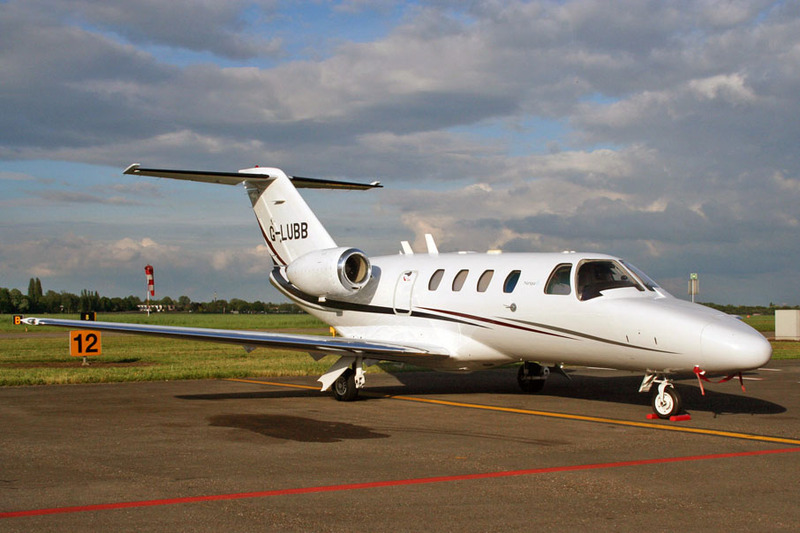 So here we are …..
“The Citation is just a PA28 on steroids” – that is what my instructor said to me on day one. Interesting. Some obvious differences though: two jet engines, faster, higher, bigger… However, there are some remarkable similarities: two wings, ailerons, elevator, rudder, trimmers, throttle control.. Lets discuss. G-LUBB is the aircraft in which I did my Type Rating. G-LUBB is a CJ1 with two William-Rolls FJ44-1A turbofan engines, each developing 1,900lbs of thrust. With a MTOW of 10,400lbs, that is quite a considerable power to weight ratio. As a result, one of the first things you notice when flying a CJ is the power and acceleration. The main difference on take off between the CJ and the PA28 is that you have to pay far more attention to the take-off roll as the aircraft very quickly accelerates to a rotate speed of 107kts. The CJ1 and CJ2 have manual thrust leavers where you adjust the N1 (fan) power setting. The CJ2 has FADEC. There is no such thing as ‘shock-cooling’ a jet engine. Neither is there carb-heat. However, you do have to be very careful about overspeed. If the thrust levers are left in a climb thrust setting after levelling off (and sometimes even in the climb), the airspeed will easily reach 263kts in a matter of seconds, and overspeed. Interestingly, in the faster CJ2, the max speed below 8,000ft is 260kts because above this speed, the windshield wouldn’t be able to take a bird strike. Go above 8,000ft and Cessna don’t believe there are any birds, so max speed increases to 275kts or 0.72M. Anyone who has done any multi-engine training or flying will know that you spend most of your time flying around on one engine, with your instructor ‘failing’ your critical engine at the most inconvenient time, closely followed by a massive grin on their face. In a piston aircraft, one engine flying can be very hard work. Often large rudder inputs are required, the aircraft is very slow and climb performance is poor – and that’s assuming you have got the flap and gear away quickly! In the CJ, principles are the same – ‘Dead Leg = Dead Engine”. However, the performance is very good – even on one engine. The aircraft will happily climb away after an engine failure at the most critical time (V1) and maintain a sensible climb rate with no problems. I guess the main difference in flying corporate charter to airline is that we do a lot of empty legs to position the aircraft to where the people want them. As a result, we use this opportunity to actually hand fly the aircraft. So, what are the differences between a CJ and a PA28? Speed – The speed range is huge. Vr: 107kts, Venr 125kts, Vmo 260kts, Vs0 approx 80kts. 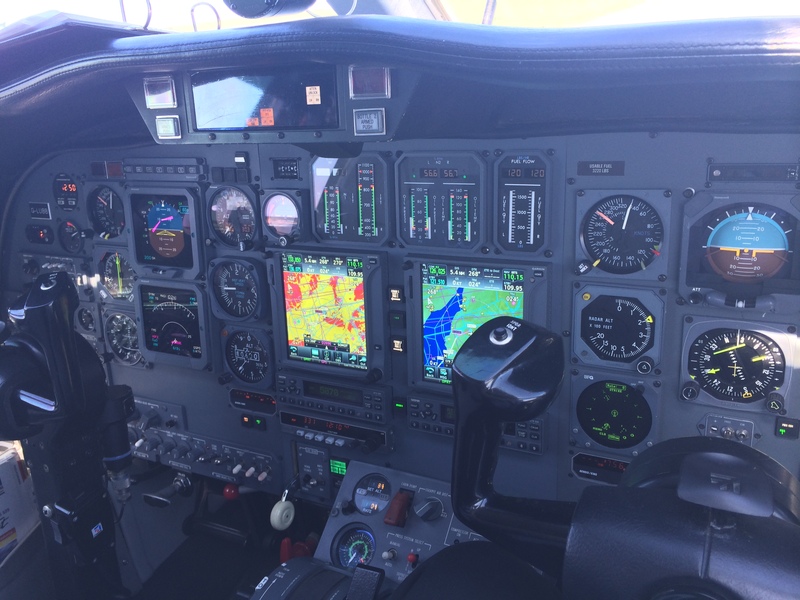 Even in G-ELUE, you have between 80kts and 105kts to work with – only 25kts. In the CJ, there is approximately 120kts in which you can happily operate. Remember slowing the PA28 down to 75kts on base from 100kts downwind, and then think about slowing from 250kts in the descent to below final landing flap speed of 161kts. Speed planning is a whole new thought process, and something which will take me some time to get used to. Steep Turns – 45 degrees and back pressure required. Power is not added, due to the lag with jet engines. To counteract the slowing aircraft, more back pressure is added to maintain altitude. Obviously this can’t go on forever, but with the larger speed range, there are enough knots there to get you round 360deg. Stalls – Standard Stall Recovery still applies, but with a few minor tweaks. Incipient stalls require a pitch down, only enough to un-stall the wings whilst at the same time applying max continuous power. Full stalls require a larger pitch down to un-stall the wing. Only when the aircraft is un-stalled is power added. The reason for the delay in adding power is due to the possibility of the aircraft entering a spin if asymmetric power is added whilst the aircraft is stalled. A spinning CJ is not fun! Fundamentally, I guess the CJ is just a PA28 on steroids. We get to hand fly the aircraft like we do a PA28, and the aircraft is certified single-crew. Roll is heavier, and level offs have to be anticipated by 500ft, not 50ft – something to do with the 7,000ft/min climb rate in an empty aircraft. The main difference is that everything happens 2.5 times quicker. Getting ahead of the aircraft can prove a struggle, especially on short trips. For example Bristol to Guernsey; as soon as top of climb is reached, it’s onto the approach briefing. The main piece of advice I can give anyone (and this isn’t just because I’m an instructor) is to learn the correct techniques for flying aircraft. PAT, APT, SHT…. they are true whether you are flying a PA28, a CJ or an A380. When was the last time you flew with an instructor? Have you developed any bad habits? A PA28 may disguise them, but if you have any ambition of flying commercially or anything faster than a PA28, then fly regularly with an instructor. It’s much better to sort out any bad habits at 100kts than it is at 250kts! In the first of our new series, Technique Tuesday, we take a look at Dog Legs. Your route is going to take you directly overhead Keevil. This is not a good idea – not only because of the parachute dropping but also because there are gliders winch launching up to an altitude of 3,200ft (shown by the /3.2 underneath the G). So, what are you going to do? The key to good navigation is accuracy. Don’t be tempted to just steer around the site willy-nilly. You won’t know how to get back onto track or how to change your ETA. Use a standard technique – The Dog Leg Technique. 3. Fly parallel to track for as long as you like to ensure you are past the hazard. 4. When satisfied that the hazard is behind you, turn back towards track by 60o. 5. Fly towards track for the same amount of time which you flew away. 6. After the time is up, turn back onto your original heading. 7. Add the time flown away from track onto your ETA. The theory of the Dog Leg is based on an equilateral triangle. In an equilateral triangle, all the angles are equal, therefore all the sides are an equal length. By making all the angles the same during the dog leg, we make all the sides the same length too. Therefore, if we were expecting to go from A to C, the time taken would be X. However, if we have to go from A to C via B, we are traveling twice as far because we have to travel two sides of the triangle, so the time taken is 2X. By timing the outward leg, we know how long we have to turn back towards track for, and how long to add to the ETA. In simple terms, we will fly two sides of the triangle, which will take twice as long as flying one side. Therefore, we need to add the time taken to fly the extra side onto our ETA. In practical applications, such as the one above, we split the triangle down the middle and parallel our track when we get to B. Since we are simply paralleling tracking, this makes no difference to the ETA. 2. All the angles turned are 60o. So next time you are on a navigation route, try it out. Don’t just simply fudge around the hazard – apply this technique! You might even enjoy the challenge. Believe it or not, this method does work. 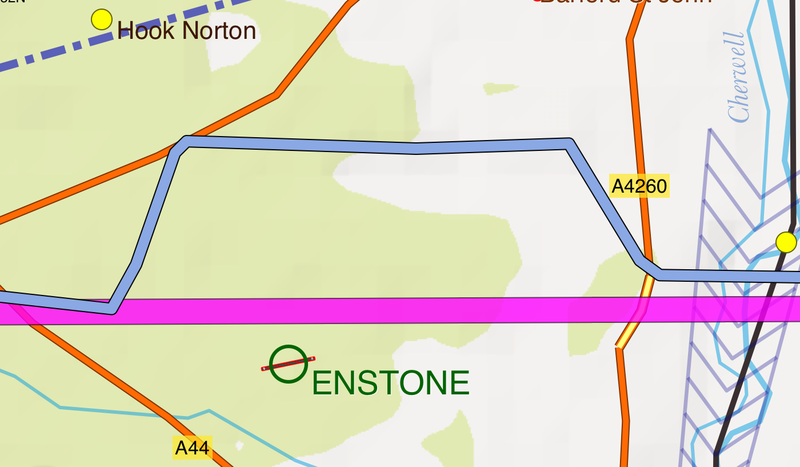 See below how one of the excellent Freedom Aviation students applied this procedure to Dog Leg around Enstone.